Due to its unique electronic material properties, Gallium Nitride (GaN) is enabling a new generation of power devices that can far exceed the performance of silicon-based devices. NexGen Power Systems’s True GaN is opening vast improvements in power conversion efficiency. Epitaxy is the technique of atomically growing a crystal, layer by layer, on the surface of another crystal. Gallium nitride (GaN) devices can be created on GaN layers that are heteroepitaxially grown on different substrates like silicon (Si) and silicon carbide (SiC) or homoepitaxially grown on GaN substrates. 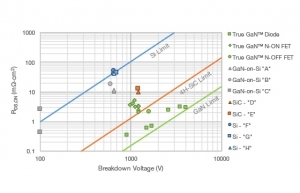 Lattice mismatch between GaN and Si or SiC leads to stress-induced dislocations that alter and degrade the electrical properties of GaN and are the source of lower breakdown voltages and poor reliability. Epitaxially growing thick (>10μm) device layers on materials with mismatched lattice and coefficient of thermal expansion (CTE) results in wafer bow, warp, and cracking. In case of GaN-on-GaN, both lattice and CTE are perfectly matched. As a result, very thick layers of GaN can be epitaxially grown on bulk GaN substrate which enables the fabrication of high breakdown voltage devices. Patented the most optimal spectrum of these offcut angles that results in best morphology and thus best device performance. Figure 1 shows the schematics of True GaN™ vertical junction field-effect transistor (VJFET) and GaN-on-Si high electron mobility transistor (HEMT). In case of True GaN, the substrate and the epitaxial layers are both GaN with extremely low defect densities. For higher breakdown voltage scaling in True GaN™ VJFET, drift thickness is scaled up with no 2-D area penalty. NexGen Power Systems has successfully demonstrated drift thickness of >40µm producing diodes with breakdown voltage >4000V and specific on-resistance 2.8mΩ.cm2. For same RDS,ON, GaN die size is 4X smaller than GaN-on-Si HEMT at for BV=600V and 7X smaller for BV=1200V. True GaN™ VJFET has avalanche capability that allows reverse biased voltage to exceed the maximum BV value for a specified energy and current limitations. True GaN VJFET also does not suffer from current collapse phenomenon because it does not rely on 2DEG (sheet of electron charge due to polarization at the interface between AlGaN and GaN). Schematic of True GaN VJFET and GaN-on-Si HEMT. Dotted green lines denote the electron conduction path. 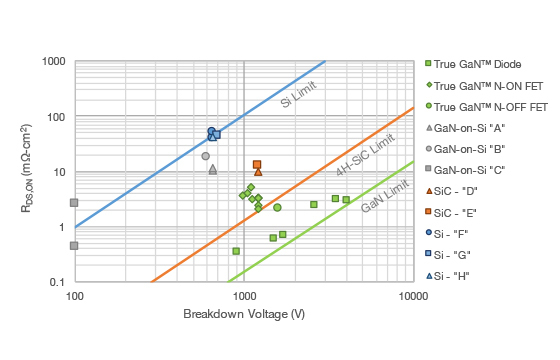 Figure 2 shows the plot of breakdown voltage vs. specific on-state resistance for four different types of materials: True GaN, GaN-on-Si, Si and SiC. Ideal region in the plot is for device to be in the lower right quadrant (low RDS,ON and high BV). Even as NexGen Power Systems continues to strive for further excellence, it can be seen that no other material system currently matches the performance of NexGen Power Systems’s True GaN™ technology. GaN is Great, True GaN is Better!